Reliable operational control in wastewater applications such as pump or lift stations often rely on a level transmitter - one of the least expensive components in the system. The United States alone has roughly 2 million pump or lift stations, without considering the industrialized world. The cost of such an installation is estimated to be in the range of $100,000 to over $1.5M for the most complicated and highest capacity station. The main function of the station is pump operation, which is directly connected to the level control system and the level sensor(s) used to track the fluid level. Level control is important because if there is a measurement failure, it can lead to a pump shut down or overflow condition. Lesser impactful, but also expensive, unplanned maintenance events may occur. While wet well installations may differ in terms of size and design, a typical simplified schematic of a station is depicted in Figure A, showing a single and dual inlet configuration. An operating dual inlet line configuration is shown in the photograph, and discharge turbulence can be seen at the bottom of the structure. In these applications, the challenge for reliable and effective pump control has evolved. The function of any level sensor is to provide an electrical feedback to the pump as to when to switch on and off. Floats have been traditionally used to provide the on and off signal for the low and high levels required for level control. Today, more technically advanced liquid level measurement methods are available that use ultrasonics, hydrostatic pressure and radar technologies. These sensors allow continuous level monitoring and as a result, the pump is operated in a more energy efficient way. The sensors are thus replacing older technology in refurbished or new installations. Lift stations, wet wells and similar infrastructure, whether it is a municipal wastewater plant or pre treatment facility, associated with an industrial plant, or other remotely located tank, have to operate consistently or risk a domino shutdown effect of the system. Such things can become costly and disruptive quickly, but a highly reliable measurement technology can prevent all these issues. Within the batch or continuous process industry, planned maintenance is an economically necessary practice to improve the overall equipment effectiveness (OEE) metrics and thus reduce the operating costs of the plant. During an unplanned event such as the failure of a control/monitoring sensor, all three components of the OEE metric are affected. These include: equipment availability, performance and quality of output produced. With continuous developments in Internet of Things (IOT) technology, basic monitoring technologies like level sensors are being implemented into an ever more challenging processing infrastructure that includes storage points, buffer inventory tanks and process dosing chemicals. Such devices are increasingly being used with the availability of lower cost devices, promoting their proliferation into places that were informally tracked earlier by shift operators. Despite the data dependency and greater integration these sensors have brought to SCADA, the reliability of the sensor continues to be an important element of the plants’ OEE success. When using a level sensor in these types of applications, it is important to consider the presence of headspace gas, target surface conditions and unwanted feedback from a well’s structural parts. Similarly, difficulties in mounting the senor should also be considered together with the potential for clogging problems or moving parts that may arise as a result of FOG (fats, oil and grease). Since ultrasonic and radar are non-contact, they avoid the problematic reliability concerns encountered by hydrostatic probes (including clogging) because no sensor components or electrical cables are submerged. If a maintenance issue develops, decontamination issues do not pose a major problem because the non-contact sensors are placed on top of the well installation and therefore the sensor can be easily accessed. While the effectiveness of radar is well recognized so is it's cost. This article focuses on the ultrasonic sensor technology differentiators for the subject applications. Firstly, most of the applications related to lifts, wet wells and pump stations do not exceed 30 feet (10 m), and in most instances a range of 20 feet (6 m) of good quality measurement distance is adequate. 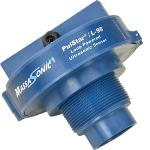 Ultrasonic sensors that cover this range are easily available from many reputable manufacturers and these sensors fit the budget for most applications. For a reliable system set-up, the majority of ultrasonic sensors available on the market work best with non-turbulent target surfaces and in a predominantly air headspace environment. Although environmental factors and set-up contribute considerably toward the reliability and accuracy of a measurement system, one factor that is not usually discussed is that of the sensor’s reliability itself. Figure B shows the Bathtub Curve, which is a hypothetical depiction of failure rate against time and also a well-established model for electronic products. It suggests that once a period designated as "infant mortality" declines, a product is likely to enter a long period of operation until there is end of life wearout. Due to the extended reliability and capabilities of the current generation of electronic components in a typical sensor, the module that is may present "infant mortality" risk is the electromagnetic wave (radar) or transducer (ultrasonic) component. Althought, infant mortality system failures can wreak havoc on the maintenance schedules, because they are unanticipated, the 'wave generating' sensor component is commonly out sourced by many sensor suppliers. The following sections discuss the elements of ultrasonic transducer reliability and how its design for application, its use in a system and its fabrication all factor into developing a highly reliable sensor. The acoustic and the mechanical design are interrelated in many respects, because one affects the other. Therefore, a strong understanding of both is critical for proper transducer design. There are, however, some clear differences between the two as well. The acoustic items include frequency, beam type, beam angle, and that the transducer not only holds up, but also performs well in multiple environments, mediums, and applications. The relationship between the acoustic and mechanical design items, with the environment, is imperative for the design and the assessment of the reliability of ultrasonic sensors and transducers. Various chemicals can affect the attenuation, thereby affecting the perceived reliability and performance of ultrasonic level sensors in such environments. Designing a transducer that is adjusted for the attenuation for the environment will deliver more accurate results, and it will help the ultrasonic in its performance within the medium for a longer period of time. Figure 1 depicts the attenuation of sound in the air as a function of humidity for different frequencies. This relationship becomes more complex when various chemical vapors are introduced. Thus, if such matters are properly considered with choosing the frequency of the transducer design, the ultrasonic sensor used with certain chemicals can give the impression to the user of being unreliable. Whereas in reality ultrasonics themselves are not unreliable, but rather have been misused due to misunderstanding. Therefore, if a transducer is designed with respect to such influencing factors, such as the effects of specific chemicals, reliable and desirable level measurement can be attained with ultrasonics. Figure 1. Attenuation of Sound in Air in dB/ft. as a Function of Percent Humidity for Frequencies of 40 kHz, 63 kHz, 100 kHz and 200 kHz. Many chemicals can also attack various materials. This can even affect the transducer within a sensor housing. Therefore, just using any "off the shelf" transducer is not the most reliable choice in sensor design. The transducer must be designed to withstand the challenges presented in the setting in which it is required to perform. This means the transducer needs to be built to withstand the attenuation of sound issues, and be constructed with proper materials that can hold up to the environment without interfering with the acoustic performance of the transducer. Dependable transducer design must begin with a proper characterizing of the conditions in which the sensor will be exposed to and required to operate. The acoustic properties of the environment, and the mechanical challenges that may exist, must also be understood to optimize performance and durability. This is true for both ultrasonic and sonar transducers and systems. The materials need to work well with the acoustics, and both the materials and the acoustics need to be fashioned to achieve desired operation in the environment. Again, the quality and the reliability of the sensoryou are building, or using, is greatly enhanced by the quality of the transducer within. Understanding the materials and the acoustics can give you an edge. Acoustic properties change in different mediums, and can give a false impression that they will not work as well as other technologies. When the transducer/sensor supplier is truly knowledgeable with respect to the acoustic properties, the materials, and is skilled in the manufacturing of electroacoustic devices — one will discover many new truths regarding the success, performance, reliability, and cost-effectiveness of ultrasonic and sonar measurement in a variety of applications and mediums. To explore this concept in greater detail, let's discuss the acoustics further: Transducers can be designed to operate at different ultrasonic frequencies and to have different acoustic radiation patterns. Sound energy is absorbed as it travels through the air. The higher the frequency, the larger the attenuation of the sound pressure for each inch in the path from the transducer to the target, and then back to the transducer. Therefore, the further the distance to the target, the lower the frequency of the transducer will have to be. Anacoustic specialist can identify what the proper frequency and beam pattern should be for any given application. It is inaccurate to assume that certain applications require some "standard" frequency or beam width. The more that a transducer designer knows about an application, the better the transducer and sensor will be — guarantying performance that outlasts all others. The design of the radiation pattern of the transducer is also important. Most ultrasonic sensors use transducers that utilize the teachings of U.S. Patents 3,928,777 and 4,011,473 that were issued to Frank Massa in 1975 and 1977 respectively. Transducers of this design have a 100 beam angle (8 0 system beam angle) for any frequency of operation. This is good for flat reflecting surfaces; however, a broader beam angle is necessary if the reflecting surface is turbulent, uneven, or tilted relative to the axis of the sound beam. A sensor is actually a system. The system includes the transducer, the electronics, and the sensor housing. Ultrasonic sensor reliability is greatly affected by the quality of the transducer and the relationship between the electronics and the materials. A higher quality transducer and a lower level of complexity in electronics result in a better sensor that is also lower in cost. Ultrasonic waveforms can be utilized to determine if there are any reflecting objects that could cause false alarms or unwanted echoes. The ability to adjust the thresholds of detection to rule out false echoes in any given material increases the overall reliability of the ultrasonic sensor is part of a high-quality design. Waveform capture also allows for troubleshooting, which allows for fast assessment in real time. Figures 2 and 3 on the following page depict how MassaSonic® Sensors can make such adjustments. Figure 2. Ultrasonic Waveform from a MassaSonic® PulStar® Plus Sensor showing a false target being detected instead of the echo from the surface of a liquid or solid material. Figure 3. Ultrasonic Waveform from a MassaSonic® PulStar® Plus Sensor with the same targets. As in Figure 2, but with the detection threshold modified to ignore the false target. Manufacturing is much more than simple assembly. In order to properly build transducers and sensors that are high in quality and reliability, it is vital to have a high level of expertise, knowledgeable and skilled workmanship, and cooperation between production and design engineering so that the best possible product is fabricated. The facility should have high-quality controls and procedures in place. The production line must contain proper tools, fixtures, and processes to control the quality of the manufacturing. Highly qualified people must also be employed to construct instruments of this sophistication. They need to be trained in the proper techniques to build, seal, and test the ultrasonics — this greatly reduces, and even eliminates, the failure rate of the products. Not always recognized, the underlying reliability of the favored level sensor critical to many wastewater plant and chemical processing steps is the ultrasonic sensor's transducer component. Reliable sensors use reliable transducers. Sensor manufacturers and OEMs can integrate lower quality transducers that may initially seem to work well, but over time they can suffer from premature system failures because of infant mortality associated with the transducer. As discussed in this article, this performance can be affected by several factors. Massa Products’ sensors, including the transducer, are meticulously designed and developed in a manufacturing environment to guarantee the highest reliability and quality. For over 70 years, the company has maintained the highest level of standards in both product quality and design reliability. 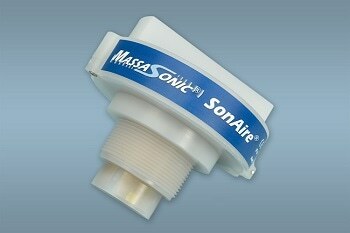 Customers can contact Massa Products to learn how MassaSonic sensors can enhance the performance of their level monitoring requirements. This information has been sourced, reviewed and adapted from materials provided by Massa Products Corp.
For more information on this source, please visit Massa Products Corp.
More Content from Massa Products Corp.
See all content from Massa Products Corp.